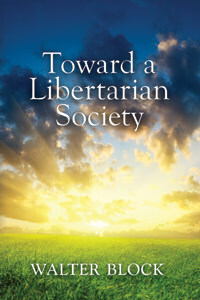 Walter Block's Toward a Libertarian Society was published last month, and it caught my attention at once, not least because its title and particularly its cover art is comparable to my own A Vision of Liberty (right); it too foresees a bright future from a dark present. I don't know whether Professor Block "borrowed" my idea, but if he did I don't mind at all, and he certainly improved it. The progression from darkness to light is softer, and the idea of a brilliant, breaking dawn fits the subject very well. That cover art reminds me also of Tom de Lorenzo's New World Rising, with its sunrise behind a tree - and with an elegantly reasoned content, also addressing the current progress from statism to freedom. - a prediction of how one can be obtained. Unfortunately, Walter Block's has neither. Had the book been entitled something like "How Government Creates Chaos" it would have taken its place among several which explain that very well. It might still have a few flaws, as below, but by calling it what he did he made it too easy to criticize. Even with its inappropriate title, Toward is a remarkable, high-value volume, notably as an introduction to the subject to thoughtful friends who are new to libertarianism, as a well-organized collection of some 46 of Walter Block's essays written during the present Century. All of them are stimulating and often humorous, skilfully selected and arranged into four groups: Foreign Policy, Economics, Personal Liberties and Libertarian Theory. Many have startling critiques of current practice and orthodoxy, so much so that a defense against my critique above might be that by showing how different things would be were society driven by libertarian principles, the book does in fact describe such a society. The reader will have to judge; I'll stick with my opinion. I learned quite a lot from Toward. For example in Chapter 7, the first of an excellent set on economics, Prof Block clarifies the difference between a town or city, and a homeowners' association - when each of them may have a similar set of rules for residents. It's not just a matter of size, and I'd been guilty of some fuzzy thinking about this. Block clears the fog by considering not someone moving in, but someone already there before the town is formed, chartered or enlarged, so proving that government edicts are not equivalent to voluntary contracts. Ultimately such a case is not exceptional but universal, for as readers are reminded on page 185, people existed long before government did. Another example: Chapter 19 presents a truly elegant consideration of labor unions in the public sector, which I had again rather fuzzily supposed was an unfortunate necessity; one monopoly (of labor) being needed to offset the power of another monopoly (the employer.) Not at all, says Block correctly: the whole claimed raison d'être of unions is to prevent ruthless employers exploiting workers, and they are effective because government grants them certain legal immunities; how, then, can they be justified when government is also the employer? - is government to protect workers from its own ruthlessness? Hilarious. However, Toward falls short here and there. Block correctly hangs libertarianism on the premise of the Non-Agression Principle (NAP), but allows that some libertarians do believe in some government for limited purposes: eg to provide courts, armies and police, as on page 167. He says he disagrees with them himself, but still describes these minarchists as "libertarian." On his own definition, that can not be so. It is the NAP, not a SLAP (a Some Limited Aggression Principle); for government always practices aggression in everything it does, as a defining characteristic. Non- does not mean Some, any more than A means non-A. This is a contradiction, and Block must know full well what Aristotle said about the kind of mind that entertains those. Another flaw is Block's repeated reference to "law" and even "punishment" in a libertarian society. By "libertarian law" (as on page 151) he may have in mind libertarian ethics or principles, but if so he should have made it clear; for "law" is a word which in customary use is inseparable from government. If laws are written, governments write them; and if a government exists, the NAP is violated. Again, confused thinking leads to contradiction. Punishment is one of the very few subjects on which even Murray Rothbard got confused, and unfortunately Block does not correct him; he even makes an ingenious case for capital punishment, by visualizing Robert Nozick's future "machine" in which life can be transferred from a live murderer to his dead victim. That is doubly false; first, it confuses restoration of the victim's rights with punishment of the perp, and secondly it depends upon a wholly imaginary premise which I'm advised by a medical expert is and always will be impossible. Nonetheless Toward a Libertarian Society will do well, and deserves to; but for those interested to know what a zero government society will probably look like, and how one is being obtained, A Vision of Liberty remains in a class of its own. And that's my completely unbiased opinion.